After much effort on the part of Alderleaf residents, students, staff, and community; the outdoor classroom is now completed! 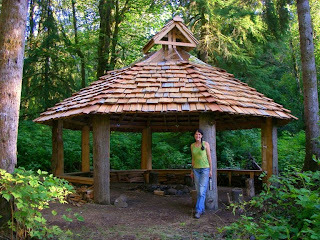 It provides a much needed outdoor learning space that is dry and out of the rain. The hand-crafted cedar posts and cedar shakes turned out beautifully. Its quite a sight! Much thanks to all that contributed. We hope it serves the community for many years to come! 2009-2010 Wilderness Certification Program Begins! 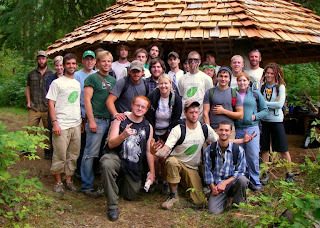 The 2009-2010 Alderleaf Wilderness Certification Program kicked off on Wednesday with orientation day! Thursday was an introduction to nature studies / naturalist skills. 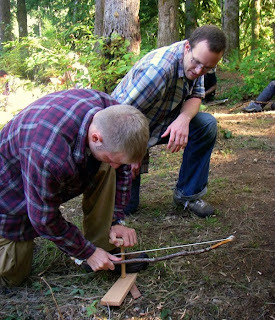 Friday began wilderness survival training with debris hut shelter construction and bow drill fire making. Lots of first time bow drill fires! This Saturday was the start of another year of the Wildlife Tracking Apprenticeship at Alderleaf. 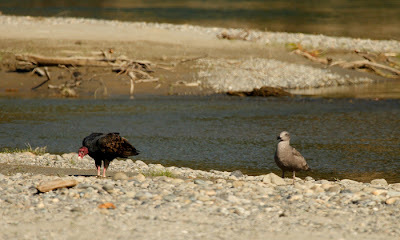 It was an amazing day of tracking along the Snohomish and the Skykomish Rivers. We observed a long list of species and their tracks including mink, muskrat, Norway rat, great blue heron, turkey vulture, bullfrog, raccoon and many others. 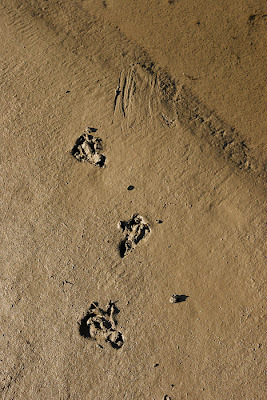 As we traveled from one amazing set of tracks to another, we picked up the relatively fresh trail of a pair of elk. We trailed them over sand, silt, mud, gravel and even through water! As we covered ground, we came upon more and more amazing sights. It was at the end of the day that we had the greatest treat of all... Two ospreys on the ground and in the water! Osprey are on the ground only extremely rarely, and when we saw them take off we ran over to take a look. 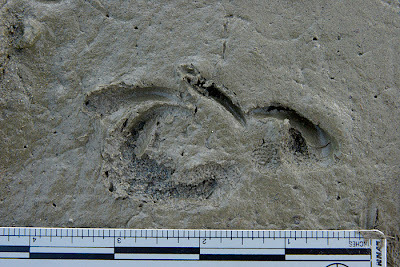 What we found was so amazing it was almost like finding the tracks of a mythical creature! The tracks were so strange... the contortions made by the toes and talons in order to allow this bird to walk are amazing and extreme. It is a great demonstration of how strongly adapted this bird is to catching fish. We found the trails of both birds. Both landed on the silty bar sticking out in a slow stretch of river, and walked rather awkwardly into the water to bath. You can see in this photo how the tracks lead into the river, and how they one nearest the water is the drag marks left behind by the one of the birds tails. Overall all, it was a fantastic day of adventure with the Wildlife Tracking Apprenticeship!